Versa-Matic’s new Flange Adapter Kits allow you to quickly, easily, and economically convert your flange pumps to female-threaded pumps. The kits are available in three sizes for use with 1″, 1½”, and 2″ non-metallic polypropylene Versa-Matic® pumps. 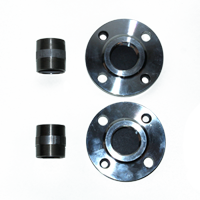 Each kit includes eight bolts, eight washers, two flanges, two gaskets, and eight flange nuts.